Pre-team serves as an introduction to the world of competitive gymnastics. Athletes will not be competing at this time but will see an increase of the amount of hours in the gym. The focus of this program is to get the athlete physically ready for the skills required for competitive gymnastics. 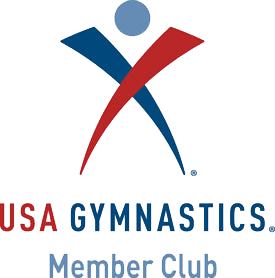 Following the USA Gymnastics program and curriculum, the Boys Team is by invitation only and includes progression through 8 levels of increasing difficulty (Levels 3-10, and Elite). Hours per week and pricing varies by level. Each level has multiple age groups and opportunities for participation and competition. Competition is carried out at the local, state, regional and national levels through USA Gymnastics sanctioned invitational meets and championship level meets. The Elite Program at USA Gymnastics has two competitive level components — a Junior Division and a Senior Division. An athlete must be 12 to 18 years of age to compete as a Junior Elite and must be at least 16 years of age to participate internationally as a Senior Elite. Talk to us about the best program for your child. By participating in gymnastics, children encounter things that will push them out of their comfort zone. Making a decision to trust themselves and their coaches is a skill that will carry over to all areas of their life. Gymnastics can assist with the development of confidence through positive experiences and achievements. Gymnastics requires concentration and commitment. Participating in a sport that has a strict code of conduct teaches the importance of safety and respect. New 22,000 sq ft facility with standard Olympic apparatuses. Coaches are dedicated to each athlete as an individual and use creativity in a structured path for success. Coaches use a combination of modern and innovative techniques focused on form, shapes, strength, biomechanics, proven progressions and flexibility. Repetition, drills, and variety in skill development produce athletes with a mastery of the sport.